This is useful for many occasions such as if you forget the password to your primary account on your computer but still have access to another 0ne or if you simply want to prank your brother. This has been tested on both Windows XP and Windows 7. 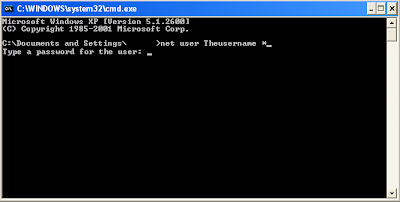 For this to work you must have access to another account because you have to use Command Prompt or CMD to change the password. Type in ‘net users’. This will show you a list of all the accounts on the computer. This is just to check and make sure you know the EXACT username of the account you want to change the password for. Finally it shall ask you to repeat the new password, click enter and BAM, you have now changed the password without knowing the original one. Great Post, that will come in handy for the release of Windows 7. I'm sure that many people will be forgetting there passwords on their new computer. Is it still possible to use the way of getting into a Windows XP account through Safe mode in the new Windows 7? I have forgotton my password on windows 7. Can you please tell me how to do it ? I just tried it on windows 7 and that does not work. "system error 5 has occurred"
The * at the end is importent. Just like in the picture. Me again, i can explain why i didn't get the "system error 5 has occurred" "Access is denied" error. DON'T DO THIS UNLESS YOU KNOW WHAT SYSPREP MEANS!" I forgot to mention, that i was about to sysprep my Win 7 image and was in "System Audit Mode". You get there if you start C:\Windows\System32\sysprep\sysprep.exe and choose "Enter System Audit Mode", check "Generalize" and "Reboot". After the reboot (don't close the sysprep window!) this command works. (/active:no) to disable it again. But it's just a wild guess. Firstly be aware - if you've encrypted any files with EFS encryption on the administrator account then these files will not be recoverable without the original password. This will ONLY effect the administrator account - it will not effect your personal EFS encrypted files (if you have any) so in most cases resetting the password is perfectly safe. Click start > right click my computer > manage > click local users and groups > users > right click administrator > set password and enter the new password twice. 2nd method: If you don't have access to an account with administrator privileges then you'll need to do an offline reset http://www.windowspasswordsrecovery.com/ I believe is the tool i've used to do it in the past on XP. PS: there is a better method than both of these - if you've created a password reset disk when you set the password or after - but i don't think i've ever met anyone who has done this. The reset disk has the advantage of keeping your EFS keys in tact whilst resetting the password. I have windows home premium. I was using the finger print reader to logon and forgot the password. Logged into my account (admin) here's how I did it. before, I was getting a system error 5, access denied. It works O.o cant believe my eyes lol. I love you. I hacked in my teacher's PC and now I can change the user pass without knowing his! I LOVE you. My teacher and I betted that I can't hack his server. Now it is on. I love this lesson thank a lots. line of the command prompt entries. it doesn't work for windows 7............need new tricks. I am an XP user! Am using Windows Home Premium,all tricks don't work! None of the tricks work, how do you avoid system error 5, access denied and i tried about 3 times! If you start the command window with 'Run as Administrator' and the user you are logged into has Admin privs, then this works. When you don't start the command window with 'Run as Administrator' then you get the access denied error. Nice tip! However, I couldn't login at all, eventually I managed to reset my lost admin password using PCUnlocker Live CD.